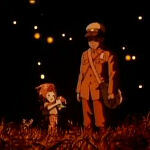 It was founded in 1985 by celebrated Japanese animation directors Hayao Miyazaki and Isao Takahata, along with their producer pal Toshio Suzuki. Their goal – to bring their style of animation and storytelling to audiences worldwide, to be the Disney of the East, so to speak. 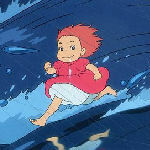 Since then, Studio Ghibli and its array of artists have been responsible for 18 feature films, a bevy of short subjects, and other contributions to the artform and medium. Many have even gone on to win that most coveted of awards, the Oscar. In celebration of the home video release of its latest offering, From Up on Poppy Hill, and the just-announced retirement of Miyazaki (his current offering, The Wind Rises, will be his final film) we look back at this company’s creative catalog and pick our 10 favorite films. 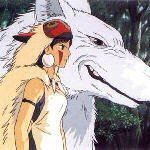 While they may not coincide with what critics think are Miyazaki et. 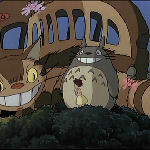 al.’s best, these are the Ghibli films that make us happy for the studio and its often stunning byproduct. It’s rare when Studio Ghibli does something for the sake of pure nostalgia, but this clever coming-of-age offering (set in 1964) provides a great deal of wistful backwards glancing. Two high school students decide to fix up an old building, only to learn it is being demolished by their local school board. A trip to the site of the upcoming 1964 Olympics provides the impetus to get the committee to change their mind. Slightly more melodramatic than most of the company’s work, but still as good. We include this one of the list for the main visual moment, a tsunami that delivers the title character back to the human friend she just made. As various sea creatures swim through the mighty wave, our heroine walks along the top of the water, giddy in her escape. 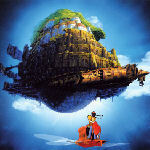 It’s a stunning sequence, filled with the kind of imagination and optical wonder one expects from classic animation. The rest of the story is equally enthralling, with nods to The Little Mermaid and ecological concerns. The title character lives in a fantasy future where another race of beings is using an enchanted weapon to stir up trouble amongst a tribe of mutant giant insects. This leads to a tale which borrows heavily from traditional mythology, modern sword and sorcery, and just a hint of Asian spiritualism. Though officially made before the founding of Studio Ghibli, this is considered the company’s spiritual starting point, and with the amazing craftsmanship on display, it’s not hard to see why. 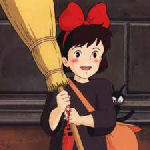 It may seem odd to say this — especially since the story centers on a teenage witch going out into the world to make her own way — but Kiki’s Delivery Service is one of Ghibli’s least fantastical. Yes, it has talking cats, sweeping broom rides, magic potions, and a last-act dirigible disaster that tops almost anything the company has done since. But at its core is the notion of growing up, of finding one’s way in life, and learning what it takes to be an adult. 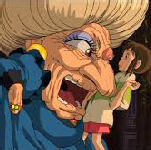 Sophie is a young girl suddenly cursed by a witch into becoming a 90-year-old woman. We then meet up with a ragtag group of amazing characters including the shape-shifting wizard of the title, a fire demon named Calcifer, a peeping bug, and a kingdom in the midst of war. 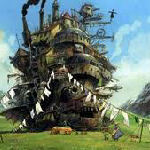 Based on a novel by British writer Diana Wynne Jones, Miyazaki (who came out of semi-retirement to direct) lavishes all manner of visual invention this adventure, turning it into one of his most compelling and complex works. As the film which truly catapulted Miyazaki to the forefront of world animation, Castle in the Sky remains a flawless primer on his standard creative conceits. 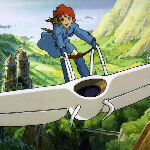 Elements that he used in his previous masterpiece Nausicaä of the Valley of the Wind are expanded on — the coming of age of a young girl, the fascination with flight, the battle between old world and new world ways, and most importantly, the belief in a destiny beyond the everyday and mundane. 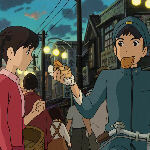 Any movie which begins with one of the main characters starving to death is not necessarily out to show its audience a good time, but this amazing Studio Ghibli film is not out to make friends. It’s out to change opinions. Considered decidedly anti-war by those who’ve seen it (though others argue for differing interpretations) we follow a feature-length flashback as Seita and his little sister Setsuko try and survive the bombing of their battle-ravaged village. It’s a unique combination of tragedy and triumph. This is epic. At nearly two hours in length, Miyazaki’s dark, frequently disturbing pro-nature adventure sees an outsider named Ashitaka interfering with the struggle between Iron Town and the resources-rich countryside (and its fantastical inhabitants). It’s a seemingly hopeless cause, but our interloper believes they can turn the tide. Heavy with action and intense battle scenes, this is one of the studio’s most serious minded pieces. It’s no wonder Miramax’s then boss, Harvey Weinstein, demanded severe edits. Lucky for us, producer Toshio Suzuki said no. When little Chihiro Ogino moves to a new neighborhood, she suddenly comes into contact with an alternative reality filled with spirits and monsters. She is eventually captured by a witch who transforms her parents into pigs. Chihiro must find a way to break the spell and get back to the real world. Mixing bits of Alice in Wonderland, traditional Japanese beliefs, and a great deal of creativity, this comes in a close second in the studio’s overall oeuvre, which is saying a lot. Few family films have dealt with the issue of death and faith more brilliantly as this one. Miyazaki is working through a great deal of rural Eastern philosophy, what with all the “forest spirits” and “soot sprites” mentioned in the narrative. The storyline actually centers on growing up too fast, being displaced from one’s natural environment, the possibility of ultimate loss, and the complementary adventure of discovering the highs — and lows — that life has to offer. 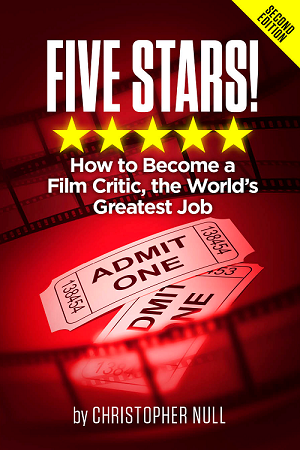 It’s a powerful, powerful film.